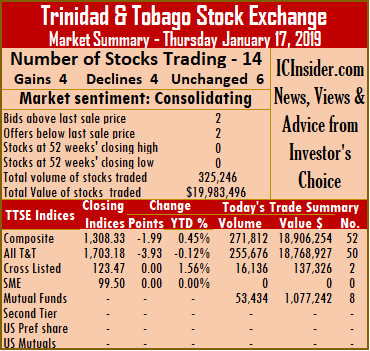 The number of companies trading on Trinidad & Tobago Stock Exchange declined, but the value of stocks trading jumped sharply over Wednesday’s level as Scotiabank traded 151,196 units valued at $9,488,113 and Republic Holdings 80,732 shares for $8,666,851. Trading ended with 325,246 shares at a value of $19,983,496, compared to 438,044 shares on Wednesday valued at $2,260,120. Market activity on the ended on Thursday with trading in 14 securities against 17 on Wednesday, with 4 advancing, 4 declining and 6 remaining unchanged. At close of the market, the Composite Index lost 1.99 points to end at 1,308.33. The All T&T Index declined 3.93 points to 1,703.18, while the Cross Listed Index remained unchanged at 123.47. IC bid-offer Indicator| The Investor’s Choice bid-offer ended at 2 stocks with bids lower than their last selling prices and 2 with lower offers. Stocks closing with gains|Clico Investments gained 2 cents to end at $20.18, with 53,434 stock units changing hands, Massy Holdings added 69 cents to close at $47.75, after exchanging 7,959 shares. Republic Financial Holdings added 1 cent and settled at $107.31, after exchanging 80,732 shares and West Indian Tobacco rose 14 cents to end at $95.40, after trading 360 stock units. 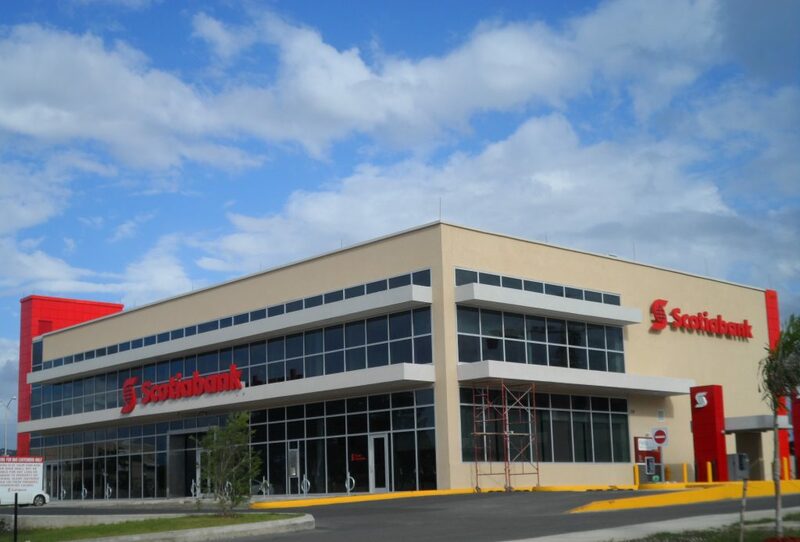 Stocks ending with losses| Agostini’s lost 25 cents and ended at $23.15, after exchanging 885 shares, Guardian Holdings fell 20 cents and completed trading of 2,986 units at $18.71, Scotiabank closed with a loss of 75 cents at $62.75, with 151,196 stock units changing hands and Trinidad & Tobago NGL shed 6 cents and completed trading 837 units at $29.06. Stocks traded firm| Ansa Mcal completed trading of 61 units at $55, First Caribbean International Bank closed at $8.50, trading 15,000 units, First Citizens settled at $34, after exchanging 500 shares. National Enterprises ended at $8, with 9,980 stock units changing hands, NCB Financial Group settled at $8.65, after exchanging 1,136 shares and Unilever Caribbean concluded at $22.90, after exchanging 180 shares.